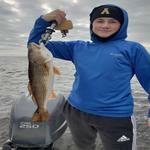 Like us on Facebook for real-time fishing report updates and photos! Call or email Capt. 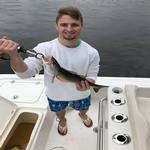 Kyle Hughes at (910) 840-7186 to book your fishing trip today. Welcome to Speckulator Inshore Fishing Charters based in Ocean Isle Beach & Sunset Beach, NC. Operated by lifelong area resident Capt. 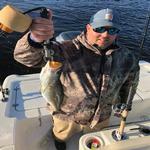 Kyle Hughes, whose family has over 3 generations of history fishing the creeks and marshes of southern Brunswick County. Conveniently located 30 minutes north of North Myrtle Beach/Cherry Grove, SC, and 30 minutes south of Holden Beach, NC, I am able maximize the fishing experience of anglers in both South Brunswick Islands and on the Grand Strand, near Myrtle Beach. 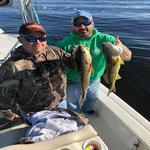 My centralized location allows me to not only have you fishing only a few minutes from the dock, but also allows me fish areas both to the north and south, giving us many more options in potential fishing areas, and allowing for more opportunities to provide you with the most memorable fishing experience possible. 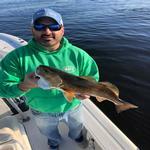 We will spend time fishing the scenic marshes, tidal creeks/rivers, and inlets that make this area unique in search of Redfish (Red Drum/Spot tail Drum), Speckled Trout, Flounder, Black Drum, Spanish Mackerel, Bluefish, and Sheepshead. Fishing areas and target species vary from season to season, and many times from day to day, but I will try my best to put you on the specie(s) of fish that will provide us with the most action possible on the day of your trip. We may use a variety of both live and artificial baits throughout your trip in order to find what the fish are feeding on that particular day. My 24' Triton LTS bay boat powered by a dependable Yamaha four-stoke outboard provides a stable fishing platform for anglers of all skill levels, from beginners to seasoned fishermen. I pride myself on teaching new anglers the mechanics of fishing from casting, to setting the hook, and so on. 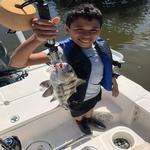 Children are always welcome, as nothing compares to a memorable family fishing experience. Fishing memories that I acquired as a child are a big part of why I am a guide today. Please check out my fishing report to see how fishing has been recently on Ocean isle and Sunset Beach and like my page on Facebook for the most up to date fishing reports and photos.